For most Toronto commuters, the subway platform is a space we pass through every day, a transient moment in the daily grind, the journey to and from work that we share with about one million other riders. Seldom is it thought of as a space for admiring art, as a venue for exploring cultural endeavours. In the twenty-first century, though, the age of technologically-fuelled multi-tasking and mass-media communication, anything can become a platform for expression. And the subway platform is no exception. The TTC became Toronto’s newest hub of creative innovation this past February as it unveiled a new concept on the screens of its subway platforms. Murder in Passing was a murder-mystery series which invited commuters to watch a new, thirty-second episode every day while they waited for the subway. Episodes of the silent, film-noir-style narrative were also available for viewing online, along with extra videos incorporating musical clues and a character-written blog. Further clues could be found in Metro newspaper, on Twitter and on Facebook, as well. The novelty of this project, which was headed by Toronto organization Art for Commuters, whose ventures are centralized around the use of the public transit system, in partnership with Pattison Onestop, the company responsible for all of the TTC’s digital display screens, lay in its ability to tap into the potential of public space and further explore the relationship between content and context in artistic creation. 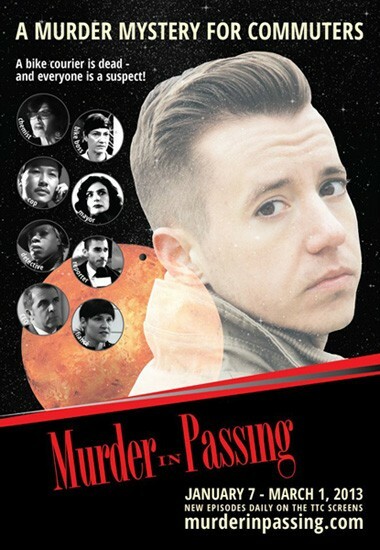 TTC promo for Murder in Passing. The TTC has obviously recognized this avenue for public engagement in the arts and is enthusiastic about giving patrons something they can incorporate into their daily lives. Murder in Passing is not their first attempt at mixing art with public transportation in hopes of inspiring and entertaining the masses. One successful foray made into the realm of public art by the TTC was an initiative called Poetry on the Way, a program in which a wide variety of published poems was posted alongside advertisements inside subways, buses and streetcars. This program, which ended in 2012 after a 14-year run on the TTC, also strove to connect with commuters on common ground and through creative expression. Evidently, this program made several works of art more accessible to the public, inviting people from all walks of life to enjoy poetry in what is both a neutral space and a familiar environment, free from intimidation. The main breakthrough of programs such as these, in displaying works in shared, common spaces and in bringing them into the public domain, was in the suggestion that any space could be a forum for artistic expression and that creativity is celebrated in our city. With Murder in Passing, Art for Commuters, the TTC and their sponsors have gone a step further from sharing and promoting art in public by actually delivering public art. The project as a whole was conceived with this purpose in mind. All of its components were crafted in the context of a public work. As is true with all works of art, the existence of the work and how it came to be is as much an element of its artistic quality as the aesthetic and sensual experience it offers. This is especially true of public art and its existence within its particular context: it both uses and creates a common, shared environment. It harnesses public space and, at the same time, contributes to it in a symbiotic relationship, a reciprocal commitment. The public, that is, the people, are necessarily implicated in this relationship. We become not only the artist’s inspiration and audience, but also his or her collaborator. Murder in Passing expands this element of interactivity through its use of media. It was billed as a “trans-media” series – a series which employs a variety of media to tell its story. By complementing the videos being shown in TTC stations with material online and in print, it broadened the scope of the artwork and gave it more points of contact with the public. It utilized a new public space to this end as well. Social media platforms such as Facebook and Twitter are effectively modern incarnations of public space. They offer even more possibilities for public engagement. Though they lack the face-to-face human interactions and physical presence of traditional public spaces, they offer a lot more opportunities for active contribution and facilitate widespread communication amongst members of the public. Such media platforms are ultimately an ideal shared space for artistic endeavours for the same reason that public transit is: both guarantee exposure to a large audience in a short period of time. In terms of the art itself, specifically in the domain of public art, the incorporation of several types of media, including social media, allow for more active involvement within the art project. A murder-mystery story is a particularly good example of this, since the public is encouraged to gather all the clues and attempt to solve the mystery. A project such as Murder in Passing also inevitably explores and plays on the aspect of metacommentary that is a part of all artistic works; their prerogative to question or to define, or both question and define, what art is. It shows that the “publicness” of public art is both content and context. It is the work’s defining characteristic and it is also the vehicle by which the work is shared. The use of media in Murder in Passing has the same quality whereby it is both an element of the artwork itself and a method of transmission. In the past decade, Toronto has really embraced artistic innovation and the public art movement with installations popping up around the city and with new festivals happening annually, the most notable of which is indisputably Scotiabank’s Nuit Blanche. With its modern and technologically diverse take on public art, Murder in Passing became a part of this tradition. It pushed the boundaries of public art, creating something new and exciting, while at the same time seeking to examine the evolution and modernization of the components at its core: public space and artistic expression. ← Crunching The Numbers: What is the “Best Team Ever”?